There’s something stunningly beautiful about the LG E6 – and that’s without even turning it on. With its unfeasibly thin picture-on-glass design and Harman/Kardon crafted soundbar, this high-end OLED screen looks a masterclass in industrial design. 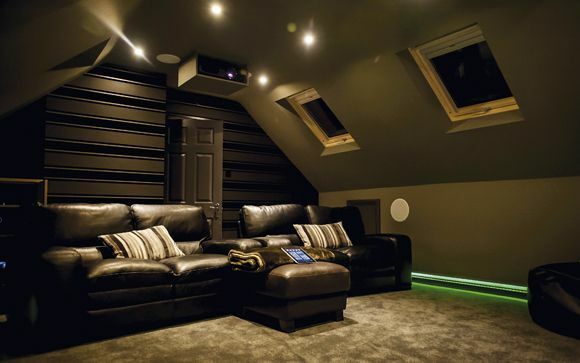 It'll make visitors to your movie room gawp in surprise, and that's without showing them the £4,200 price tag. The OLED65E6 sits below LG’s Signature G6 flagship, but uses the same panel and image processing technology – differences between the two concern the potency of the speaker bar and stand design. While we're reviewing the 65in version here, it’s also available in a 55in guise. The set sports four HDCP 2.2-compliant HDMIs and three USBs (one of which is a fast 3.0 variant), but analogue video is relegated to minijack inputs. There's an optical digital audio output and Ethernet port, plus a single satellite tuner input. Terrestrial TV comes via solo Freeview HD with Freeview Play. Obviously there’s (dual-band) Wi-Fi onboard. There are two remotes, a conventionally designed one incorporating a Magic Pointer to navigate LG's WebOS platform, the other a slim job for those averse to buttons. Finishes appear metallic but are, in fact, just silver plastic. LG’s user interface work continues to impress. Navigation is quick. A settings menu throws up relevant graphics on the right of the screen. If you can’t do what you want here there’s the option of a more detailed menu on the left. Now in its third iteration, WebOS has had several minor modifications since launch, but usability remains largely unchanged. Apps, channels and inputs are accessed via a bar at the bottom of the display. You can reorder the tiles here to suit. Content support is wide. There’s a good range of video services, including BBC iPlayer and ITV Hub, plus Netflix, Amazon and Now TV. Onto the real attraction of this set: image quality. Pleasingly, this is superb straight from the box. There’s a veritable smorgasbord of viewing options – Standard, Eco, Cinema, Sports, Game, Photo, HDR Effect (variable between Low, Medium and High), plus ISF Expert Bright and Dark Room settings. Those uninterested in calibration (the TV offers extensive controls) can stick to Standard or Cinema. The HDR Effect is intended for SDR content. Personally, I think this is best ignored, although I know my colleague John Archer is more partial to pseudo HDR. As a rule of thumb, sharpness should be set no higher than 10, as excessive ringing starts to kick in beyond that, effectively obscuring fine detail. Unlike many rival sets, and perhaps a USP for some, you still get to wear funny glasses. The E6 is passive 3D compatible, and also supports Dual Play for split-screen gaming – although I’m not sure anyone actually does that any more. Two pairs of specs are provided. Having suffered some dreadful passive 3D implementations on previous LG LCD screens, it’s a relief to report here that the presentation is generally excellent, with a real sense of depth and no obvious crosstalk. The image (on the Tangled Blu-ray) did sporadically seem to disengage from the bezel and pivot for no good reason, but overall the effect is terrific. And with 2D the E6’s picture performance is outstanding. This set looks positively sensational with regular 1080i broadcasts, be they via Sky or DVB. Upscaled HD content has a sheen that's beguiling and bright peak whites that pop – you’ll notice this immediately on graphics and white text. And with 4K content, fine detail can be sublime. Of course, it’s in the contentious area of HDR (High Dynamic Range) that things get particularly interesting. The set is certified Ultra HD Premium. As it’s an OLED panel, though, this means it needs to deliver at least 540 nits peak brightness (rather than the 1,000 nits of LCD rivals) and a better-than-LCD black level of 0.0005 nits. This it appears to manage without any problem, and because OLED is self-emissive, there’s no backlight clouding issues to diminish bright highlights. Deep blacks are gorgeous. While the set clearly doesn’t offer the luminosity of rival premium LED TVs, the dynamic effect is still palpable. When watching HDR 10 content from a 4K UHD Blu-ray, viewing modes are locked to HDR Standard, HDR Bright and HDR Vivid. Of these three, I found the Bright setting the most rewarding. In Standard mode, content seemed a tad flat and lacking in detail. Currently, LG is the only UK screen brand to offer support for Dolby Vision (and frankly looks likely to be for some time). So what does this actually mean? Well, if you opt to watch one of the few Dolby Vision-encoded streams from Netflix (Marco Polo or Adam Sandler’s Ridiculous 6), you’ll notice a change to your viewing options. They become Movie Bright, Movie Dark and Vivid. While Ridiculous 6 may not be a rollicking classic, via this LG it does feature beautiful textures, and has real glint and shine – Danny Trejo's golden grille looks to be worth a small fortune. When playing Amazon Video HDR, the mode option changes again, to a plain old HDR Standard preset. It's impossible to compare HDR 10 with Dolby Vision on the same Netflix streams – you get what you're given. So does Dolby HDR look better than HDR 10? At this stage, with a paucity of content and no other compatible displays, it'd be foolish to say. The Dolby format certainly looks good on this LG, though, showcasing nuanced colours and subtle light handling. On some super-bright LCD TVs, peak HDR can actually be pretty startling and hard to get used to. At no point does that apply to LG's OLED visuals. This is a sumptuous eyeball experience, rather than overpowering. Of course, HDR content isn't just about peak whites; the extended colour gamut is also impactful. The 4K Blu-ray release of Batman v Superman... reveals just how dramatic HDR colour grading can appear. The wider gamut gives full rein to Zack Snyder's heavily-filtered aesthetic. When Superman descends from the sky prior to the explosive Senate hearing, he drops down against a backdrop of yellow-orange clouds. The sun, clearly defined, peaks out top-right, with the surrounding sky a deep blue. The same sequence on the SDR Blu-ray is nowhere near as beautiful; the clouds above the Capitol building are white-grey and the sun an indistinguishable brighter blob. The sky isn't deep blue either. It looks remarkably different. Care needs to be taken with motion handling, as LG’s Trumotion processing is heavy-handed. Both the Smooth and Clear settings introduce overt motion resolution artefacts around moving objects. Turning Trumotion off solves this, but there’s a drop in motion resolution. The best catch-all option is the User setting. A combination of de-judder at 3 and de-blur at 10 results in minimal motion artefacts and smoothed horizontal pans. Overall, the E6 is a magnificent TV. It’s the best from LG that I’ve ever seen, and in many ways is the spiritual successor to Pioneer’s long-lamented Kuro plasma line. There’s an intensity and purity to its images which is rewardingly similar. And functionality is forward-thinking, with Dolby Vision an exciting addition. That said, HDR is almost a distraction when it comes to explaining the inherent beauty of the E6's image quality. Those deep, perfect blacks and rich colours make for a stunning visual experience, be the content HD or 2,160p. Mix in a superior smart TV platform, cracking sound system and superb design – plus better value than the superficially pimped up G6 – and you have a high-end display that demands to be seen. We say: OLED makes a convincing case for itself with this drop-dead gorgeous display – fabulous with HD, stunning with 4K HDR, it makes even rotten TV shows worth watching.